How fabulous is this studio apartment? It's the home of Matthew Kowles, the General Manager for Charlotte Moss' firm - plainly, the design apple doesn't fall far from the tree. You can see more in Lonny's December 2012 issue, but here's a sneak peak. A few of my favorite features: the bed frame treats the bed as a legitimate piece of furniture, even a feature, rather than stuffing it into a corner. Placing the TV on the same plane as the photo wall is a trick that downplays the screen. And, my favorite golden rule for small spaces is in action here: keep it off the ground! All the furniture in this room has several inches of clearance, and the coffee table, with its central spot making it the likeliest space hog, has airy legs and a carpet-colored marble top that allow the eye to move on. But the best bit is the desk: it's a truly marvelous look on so many levels (ha) - Matthew preserves an heirloom while modernizing it and (my favorite part!) the glass top pulls into the center of the room and becomes a dining table. Fabulous. 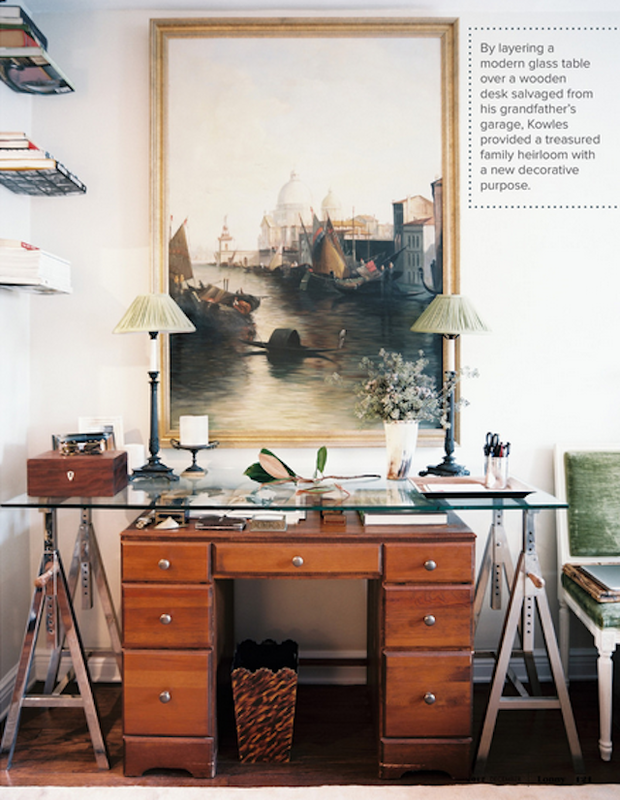 Enjoy the rest of this space in Lonny's December 2012 issue. what a cool/different idea for that desk - wow! i love the mix of old and new. I love the desk!I wish I have that in my office! This apartment is unbelievably stylish and I LOVE your tip to keep stuff off the floor.....it is so true!